Wm. E. Welmers surveys a wide range of structural characteristics, both phonological and grammatical, of the languages of sub-Saharan Africa. 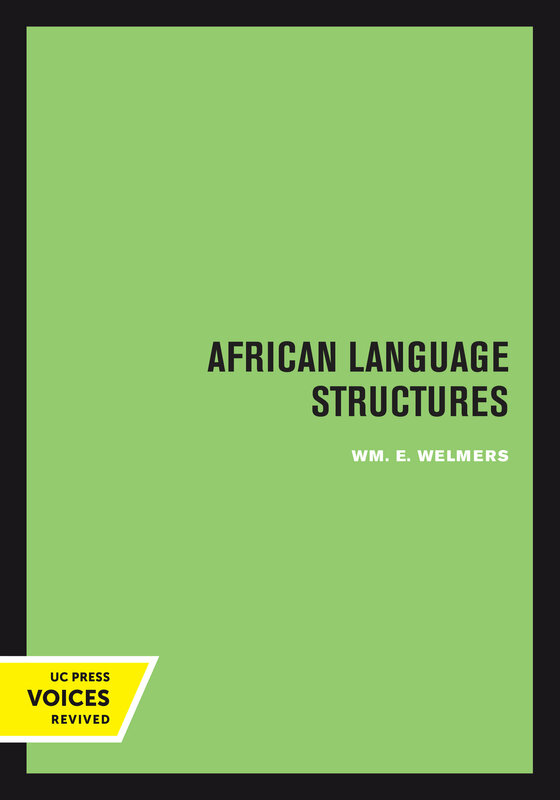 Drawing on thirty years of experience in the analysis and teaching of African languages, and on work done on some seventy spoken languages, Welmers has organized the volume by linguistic topic. Thus there are extensive discussions of tonal systems in languages from all over sub-Saharan Africa, of noun classes and concord in the Bantu and other Niger-Kordofanian languages, and of the varieties of verbal constructions found in representative languages. African Language Structures emphasizes the organization of language data rather than the technicalities of theoretical linguistics. The material is presented in such a way that students working on the analysis of other languages can be guided in their procedures; Welmers suggests not only what types of structures may be expected, but also how they may be discovered and described. This work is unique in the depth of its linguistic insight over the entire spectrum of language structure and in the breadth of its language coverage. Wm. E. Welmers was Professor of Linguistics and African Languages at the University of California, Los Angeles. A pioneer in the development of linguistically oriented intensive language teaching, he published numerous monographs and articles on African languages as well as on other groups of languages.